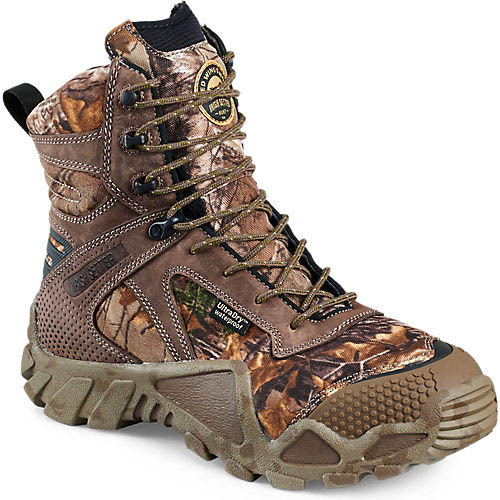 If you are an avid hunter looking for outstanding value on the big game hunting boot market, you should consider the Irish Setter Men’s 2870 VaprTrek Waterproof 8″ Hunting Boot. Equipped with all the relevant features you could ever hope for in a pair of outdoor boots, the high-performance VaprTrek Boots provide very quality results in all kinds of terrains and high customer satisfaction. It therefore comes as no surprise that these boots have been acclaimed by hunters and hikers alike as one of the finest outdoor boots money can buy. But in order to help you get a better idea of the remarkable abilities of the VaprTrek Boots in the field, we have taken it upon ourselves to create a detailed Irish Setter Men’s 2870 Vaprtrek Waterproof 8″ Hunting Boot review, which you can read below and decide for yourself if these renowned pair of hunting boots fit the bill. 1.10.1 Q. Who are the manufacturers of the VaprTrek Boots? 1.10.2 Q. How many colors can I purchase the VaprTrek Boots in? 1.10.3 Q. What is the height of the boot? 1.10.4 Q. Are these boots insulated? 1.10.5 Q. How much do these boots weigh? 1.10.6 Q. How do I take care of my VaprTreck Boots? 1.10.7 Q. Are the VaprTreck Boots backed by warranty? The VaprTrek Boots come with the groundbreaking Scent Ban™ technology whose primary role is to prevent unpleasant odor from developing in the boots. This premium scent control technology is fused into the boots’ leather and other materials such as the boots’ linings and footbeds to kill bacteria responsible for causing unpleasant odors. This means you can walk in the boots for miles and miles without worrying about developing foot odor. Besides the obvious embarrassing issues that come with foot odor you should know that some animals can easily perceive hunters’ foot odor from faraway distances and escape. So in one way or another, the ScentBan™ plays a role in keeping your presence hidden from game. If the animals you are hunting can’t perceive your scent, then that significantly increases your likelihood of killing them. Another groundbreaking feature that the VaprTrek Boots incorporate is the breathable UltraDry™ Waterproofing System, which as the name implies, gives the boots the ability to repel water. In addition to the brilliant waterproofing ability of this feature, it also comes with a moisture management lining that provides you with comfort all day long. The primary role of the ultra-lightweight RPM™ composite technology that the VaprTrek Boots come with is to enhance the strength and durability of the boots while at the same time significantly reducing the weight of the boots, thereby making them very comfortable to wear for long periods of time. It must be known that this feature is primary responsible for making the boots one of the lightest big game hunting boots on the market. The manufacturers printed a Realtree Xtra pattern on the boots’ leather upper in order to increase your likelihood of concealing your presence from the animals you are hunting. Realtree Xtra®, which is a realistic camouflage pattern that comes with lifelike images, prevents your boots from standing out in the bush while you are hunting, thereby making it difficult for detail-oriented animals to detect your presence and flee. The VaprTrek Boots get their ruggedness and durability partly from the ArmaTec™ technology, which provides the boots with an abrasion-resistant and tough protective shield in high wear areas of the boots. This helps in greatly increasing the lifespan of the boots. Unlike some hunting boots which put a great deal of pressure on your shin, the VaprTrek Boots don’t behave that way. These boots have been engineered with the patented CuShin™ Comfort tongue technology that comes with a well-padded mesh and a 4-way stretch nylon to minimize the pressure the boot’s tongue puts on your shin. The end result is extreme comfort in your shin area. These boots are extremely light yet very durable. They are comfortable to wear. They come with slip-resistant rubber soles that provide excellent traction. The UltraDry breathable/waterproof technology the boots come with make them excellent water repellents. These boots come with ScentBan that kills odor-causing bacteria, thereby preventing foul odors from developing within the boots. They come backed by a 12-month warranty. Since the boots are non-insulated, they are not the best when it comes to keeping your feet warm in very cold climate. Q. Who are the manufacturers of the VaprTrek Boots? A. The boots are manufactured by Red Wing Brands of America, Inc. (also known as “Red Wing Shoes”), which is one of the world’s biggest and oldest manufacturers of high-performance boots. Q. How many colors can I purchase the VaprTrek Boots in? A. You can purchase these boots in only Realtree Xtra Camouflage. Q. What is the height of the boot? A. The boot is 8 inches in height. Q. Are these boots insulated? A. No. They are non-insulated. Q. How much do these boots weigh? A. 6. oz/ 2 lbs. Q. How do I take care of my VaprTreck Boots? Regularly clean the boots with ordinary water and clean piece of cloth. Condition the boots with a good conditioning formula. Red Wing Shoes recommends you use the NaturSeal™ to condition the boots. The last step in the care process is to use a good leather protector on the boots. The manufacturers recommend that you use their Essential Leather Protector for the job. Q. Are the VaprTreck Boots backed by warranty? A. Yes, they are. According to the manufacturers of the boots, if within 12 months of purchasing the boots, a defect in workmanship or materials occurs in the boots as a result of normal use, they will repair or replace them for you. The Irish Setter VaprTrek Boots review above has clearly shown you why the boots are widely acclaimed by outdoor enthusiasts – especially avid hunters as some of the best hunting boots you can ever wear for a serious hunting expedition in the heart of the wilderness. Not only are these boots very rugged but they are also super light, comfortable and very dependable. If you are one venturing into serious hunting, the VaprTrek Boots will suit you much better than several others on the market.